As always, the tennis year is in full swing right from the start. From the Australian Open and the tournaments in Brisbane and Perth that precede it, to the ASB Classic in Auckland plus the first round of the Fed Cup, and then moving on to smaller events like the Taiwan Open and the Qatar Total Open, January and February are packed with top-quality tennis. However, major tournaments on indoor courts are still something of a rarity, so Australian sports betting enthusiasts may also want to take a look at the Memphis Open from February 13-19. The Tennessee ATP tournament is the only one played in the USA on indoor hard courts, which have a different effect on each player; depending on which surface they are most comfortable on. Played since 1975, the tournament also has the distinction of seeing nine of its winners top the ATP rankings by the end of that year. This record started with Sweden’s Bjorn Borg in 1977, and also includes US greats like Andy Roddick, Andre Agassi and Jimmy Connors. Defending champion Kei Nishikori from Japan is the only player to have won the Memphis Open more than twice; he has taken the championship for the past four years in a row. At the same time, the second notable men’s tournament on indoor hard courts for the year starts in Rotterdam, the Netherlands. 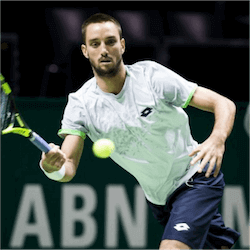 The Rotterdam Open, now known by the sponsor tag the ABN AMRO World Tennis Tournament, also runs from February 13-19. It is part of the ATP Tour’s 500 Series, and will be played at the Ahoy Rotterdam indoor stadium as usual. Of the two tournaments, ABN AMRO World Tennis is probably going to be the one that gets the most punting action from Australia. Some pretty impressive talent is already confirmed for the singles draw. These include Spain’s Rafael Nadal, Switzerland’s Stan Wawrinka, Belgian David Goffin, France’s Jo-Wilfried Tsonga, Czech Tomas Berdych, Austria’s Dominic Thiem, and Aussie star Nick Kyrgios. Wawrinka, currently world Number 4, will most likely be the top seed.